There are 3 banks which all use Loops made with a DSI Evolver which are all recorded at 100BPM. 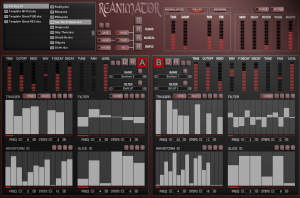 Reanimator uses time stretching so that it is possible to play the loops at a constant tempo and change the pitch, although the further you get away from the original pitch, the more artifacts will be heard which can be interesting. By default it uses kontakt High Quality algorithm which can get a bit CPU heavy with extreme speeding up or with high pitches, and so a second identical instrument is also included which uses normal Quality Time Stretching which uses less CPU. Reanimator also includes an FX Section with Reverb + a selection of Impulse Responses, Stereo Clocked delay and a choice of Flanger, Phaser or Chorus. There are Randomizers at the local and Global level tuned to give interesting results, as well as a Default system which can be customized. Finally it has it’s own preset system which is always visible ready to load or save presets.